To report a rare case of maxillary canine with two root canals. The case describes the treatment of a maxillary canine with two root canals which was referred from department of prosthodontia for intentional root canal treatment for prosthetic rehabilitation. Clinical examination revealed a maxillary canine with carious lesion and responded within normal limits to electric pulp test. Radiographic examination revealed a distal carious lesion (close proximity to pulp) and also appeared to be an additional canal in this permanent maxillary canine. The pulp canal system in any tooth has the potential of being very complex with branching and divisions throughout the length of the root. Vertucci classified the root canal configurations of human permanent teeth into various types ranging from single to three separate and distinct canals. In mandibular anterior teeth, the prevalence of two or three root canals has been reported to be as low as 1% and as high as 43%. Mandibular canines are recognized as having one root and one root canal in the majority of cases. Investigators have reported on the anatomical variations associated with mandibular canines and that 15% of mandibular canines presented with two canals with one or two foramina. , Heling et al, reported a case of a root canal retreatment in a mandibular canine with two roots and three canals. Orguneser and Kartal in their study recognized three canals and two foramina in a mandibular canine. D'Arcangelo et al, also reported root canal treatment of two Mandibular canines with two roots and two canals. All these cases are suggested to be the result of the abnormal development of the tooth and the root. Maxillary canines are statistically considered to be single-rooted, single-canaled teeth and two root canals in a permanent maxillary canine is a rare condition. Multiple canals and multiple roots of maxillary anterior teeth with or without any developmental anomalies have been reported. In this report, we describe a case of two canals in a single rooted maxillary canine. A 45-year-old female patient was referred to our department for endodontic treatment before the prosthetic rehabilitation (Fixed partial denture) of a maxillary left canine 23 (FDI). The tooth was asymptomatic and palpation and percussion were negative. Pre-operative radiograph shows radiolucency involving dentine in distal surface and also showing two separate radiolucent lines running till middle third of the root suggestive of two canals [Figure 1]. It responded within normal limits to electric pulp test. Local anesthesia was administered and a medium thickness rubber dam of 6 × 6 inches (Hygienic; Coltene Whaledent) was placed to isolate tooth #23. Access to the pulp canal space was achieved using a round diamond bur (ISO 801001016, Komet, and Lemgo, Switzerland). Further modification and exploration in the access cavity demonstrated the presence of a different canal orifice, lying palatal to the main canal [Figure 1]b. 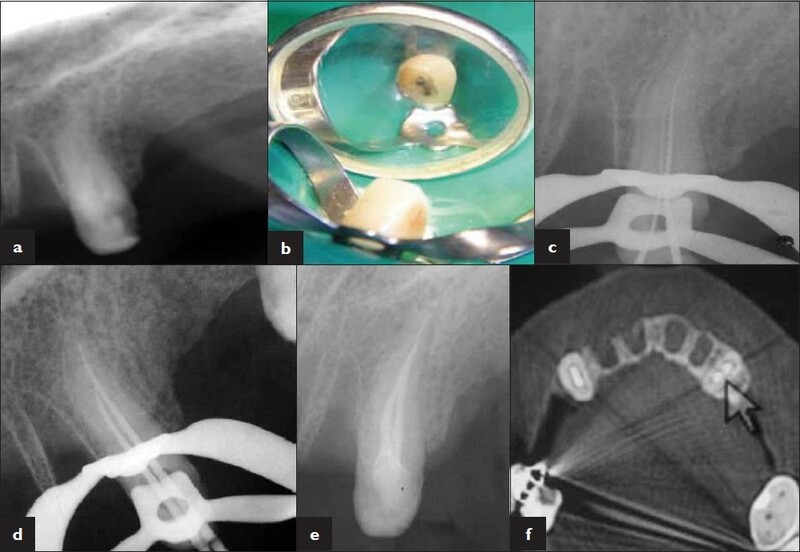 Working length was determined by placing H file # 20 in buccal canal using apex locator (Tri auto ZX ,J morita; USA) and K file # 15 was placed in the palatal canal, radiographic image was taken, it was found that the palatal canal joined the buccal canal just in the apical third of the root (type II configuration of Vertucci classification of root canal configurations) [Figure 1]c. The canals were cleaned and shaped with ProTaper instruments. One milliliter of 1.25% NaOCl was used for irrigation between each instrument. After the final irrigation with 2% chlorhexidine, the canals were dried with paper points and obturated with ProTaper Gutta percha using AH Plus sealer [Figure 1]d and e. The patient was recalled after one week and found to be asymptomatic and CT scan was taken for visualization of canal system(Vertucci Type 2) [Figure 1]f. Post-endodontic restoration was done and the patient was referred to prosthodontic department for fixed prosthesis. During the past years, there have been many studies on pulp morphology. The anatomical studies of Vertucci,  Pineda and Kuttler,  all state that maxillary incisors have a single root most of the time. A study by Caliskan et al, using the clearing technique has shown a different type and number of root canals, their ramifications, and frequency of apical deltas of permanent teeth in a Turkish population. The percentage of permanent maxillary canines with type V canal configuration (one canal leaves the pulp chamber and divides short of the apex into two separate and distinct canals with separate apical foramina) was 2.17 and type III canal configuration (one canal leaves the pulp chamber, divides into two within the root, and merges to exit as one canal) was 4.35. However, they could not find any type II canal configuration in their study. There is a high incidence of fins which run longitudinally within the walls of the canal and a network of communication between canals lying within the same root attributing to multiple root canals in single rooted teeth. Alapati et al, and Onay et al, reported Type II canal configuration in maxillary canines and Weisman also reported a bi-rooted maxillary left canine. The present cases have similar characteristics to that reported by Alapati et al, and Onay et al. Two distinct canal orifices were located in a labial/palatal configuration. In both cases, the palatal canal coursed laterally and then curved back to join the main canal in the apical third, forming a type II canal configuration. The objectives of root canal treatment are to debride the root canals of pulp tissue remnants, microorganisms and bacterial products prior to obturation, thus inducing a favorable environment for healing of periradicular tissues. Failure to find and fill a canal has been demonstrated to be a causative factor in the failure of endodontic therapy. It is of utmost importance that all canals be located and treated during the course of nonsurgical endodontic therapy. Although the prevalence of the root canal anomalies is rare, they can be detected by careful examination. A thorough knowledge of the root canal anatomy is essential for successful treatment. In addition, a careful endodontic exploration as well as radiographs from several different angles may lead to suspicion or identification of additional canals and is certainly essential to give the highest possible chance for success. This report shows a case of the presence of a second canal in a single-rooted maxillary canine. This case report is given to increase the awareness of clinicians on aberrations in tooth morphology of anterior teeth and to show that special care is needed to detect and treat possible extra canals. 1. Hulsmann M, Schafer E. Problems in gaining access to the root canal system. In: Hulsmann Michael, Schafer Edgar, editors. Problems in Endodontics: Etiology, Diagnosis and Treatment. 1 st ed. Germany: Quintessence Publishing Co Ltd; 2009. p. 145-72. 2. Vertucci FJ. Root canal anatomy of mandibular anterior teeth. J Am Dent Assoc 1974;89:369-71. 3. Bellizzi R, Hartwell GR. Clinical investigation of in vivo endodontically treated mandibular anterior teeth. J Endod 1983;9:246-8. 4. Heling I, Gottlieb-Dadon I, Chandler N. Mandibular canine with two roots and three root canals. Endod Dent Traumatol 1995;11:301-2. 5. Orguneser A, Kartal N. Three canals and two foramina in a mandibular canine. J Endod 1998;24:444-5. 6. D'Arcangelo C, Varvara G, De Fazio P. Root canal treatment in mandibular canines with two roots: a report of two cases. Int Endod J 2001;34:331-4. 7. Burns RC, Buchanan LS. Tooth Morphology and Access Openings. In: Cohen S, Burns RC, editors. Pathways of the Pulp. 6 th ed. Boston, MA, USA: Mosby; 1994. p. 128-78. 8. Vertucci F. Root canal anatomy of the human permanent teeth. Oral Surg Oral Med Oral Pathol 1984;58:589-99. 9. Pineda F, Kuttler Y. Mesiodistal and buccolingual roentgenographic investigation of 7,275 root canals. Oral Surg Oral Med Oral Pathol 1972;33:101-10. 10. Caliþkan MK, Pehlivan Y, Sepetçioðlu F, Türkün M, Tuncer SS. Root canal morphology of human permanent teeth in a Turkish population. J Endod 1995;21:200-4. 11. Alapati S, Zaatar EI, Shyama M, Al-Zuhair N. Maxillary canine with two root canals. Med Princ Pract 2006;15:74-6. 13. Weisman MI. A rare occurrence: A bi-rooted upper canine. J Endod 2000;26:119-20. 14. Seltzers S, Bender IB. The Interrelationship of pulp and periodontal disease. In: Seltzers S, Bender IB, editors. The Dental Pulp. 1 st editors. Chennai, India: All India Publishers and Distributors; 2000. p. 303-23.